Sometimes with so many things to make at do for Christmas it seems like it can be kind of easy for Thanksgiving to get sort of forgotten about. 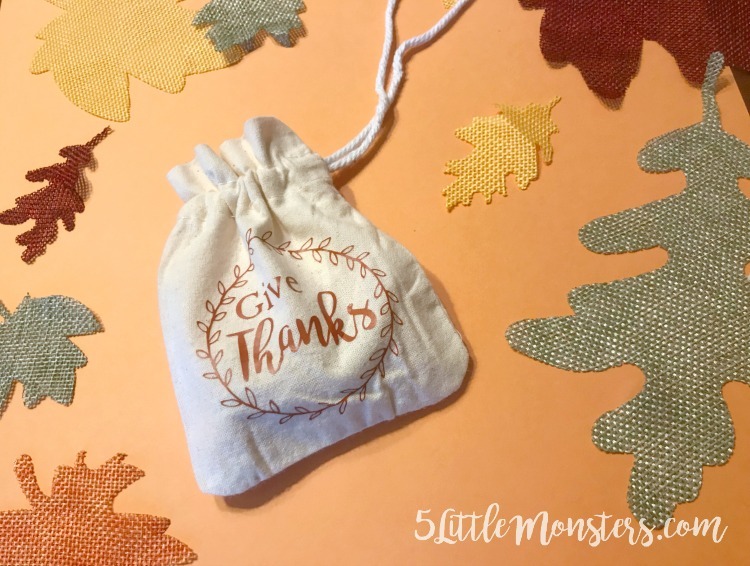 I have lots of Christmas projects to share over the next couple of months so I wanted to make sure to take some time to share a few Thanksgiving projects over the next week or so. 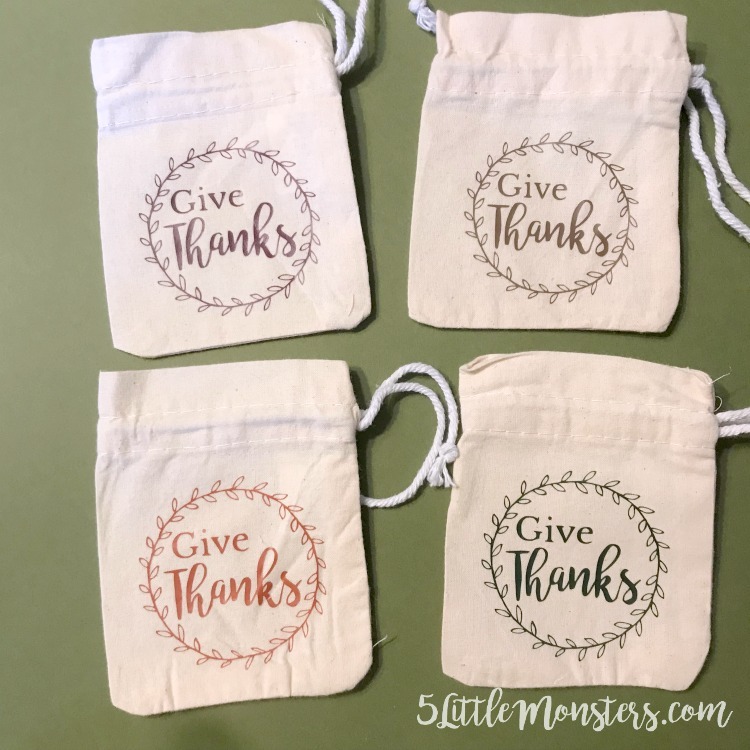 The first project that I want to share is a set of Thanksgiving Favor Bags. 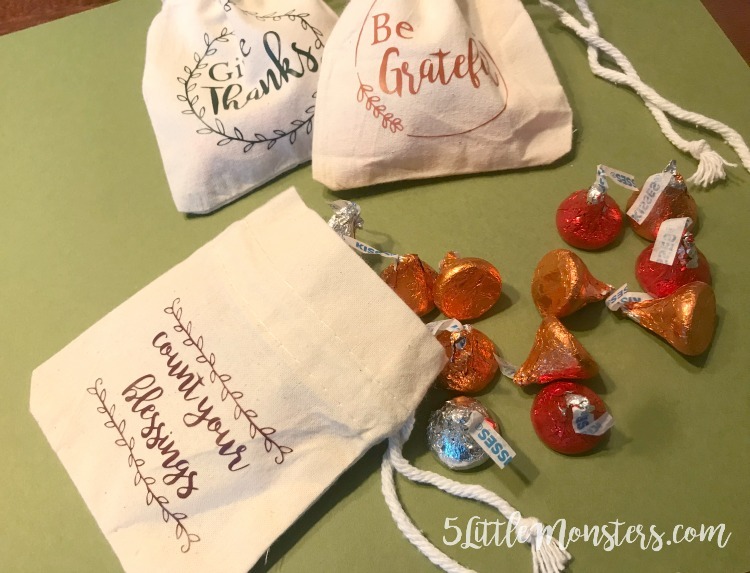 I ordered a set of little drawstring bags from Oriental Trading Company, along with some fall colored Hershey Kisses and a few other Thanksgiving items. I designs some little decals to cut out on my Cricut and iron on to the bags. The bags come in sets of 12 and I came up with 3 designs so I used 4 different colors of iron on that were fall-ish colors. The 3 designs say Be Grateful, Give Thanks, and Count Your Blessings. I added leafy wreath and border designs to make them all different but still tie them all together. I cut them out in brown, plum, forest green, and burnt orange. I filled them up with fall colored Kisses but any small wrapped candy or treat would work. 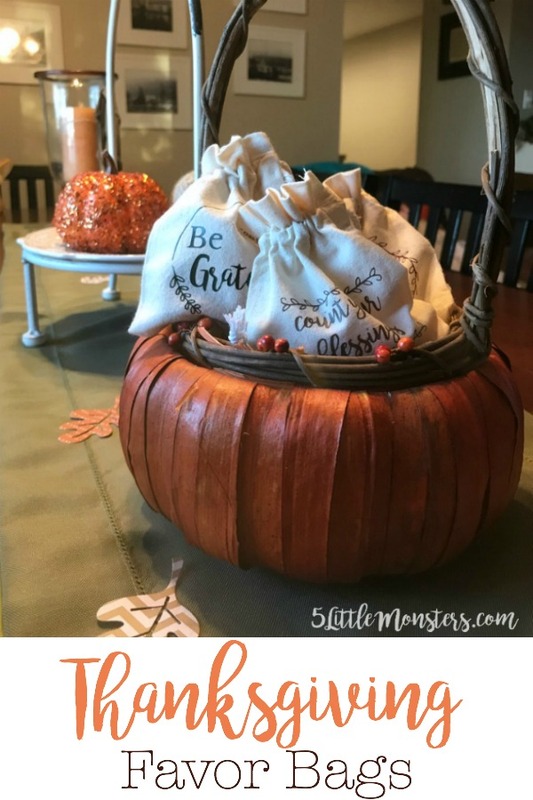 They would be cute in a little basket for people to take, set on plates at Thanksgiving dinner as part of the place setting, or as a fun little treat to give to friends or neighbors during the month of November. Download the png file with the 3 designs (click the link in the supply list) and upload to Cricut Design Space or other design software. I am only familiar with Cricut so I can't offer any help with other programs. Open the design in you software and size it to the size needed. I made mine so that each design was about 2.5" wide. Cut out on iron on, make sure to mirror your design before you cut. I cut one set out of each of my 4 colors since I had a dozen bags. Press the designs on the bags. 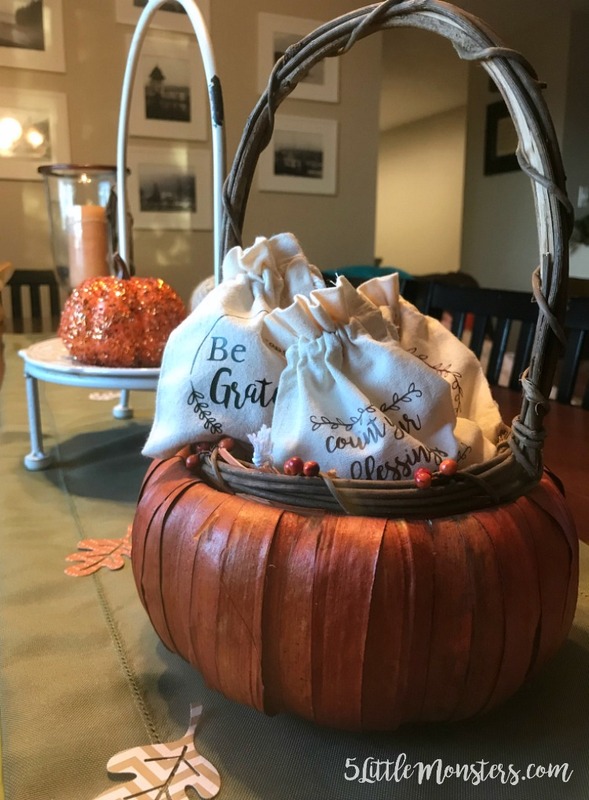 Once the designs are pressed on the bags the only thing left to do is fill them with candy and set them out or give them away. 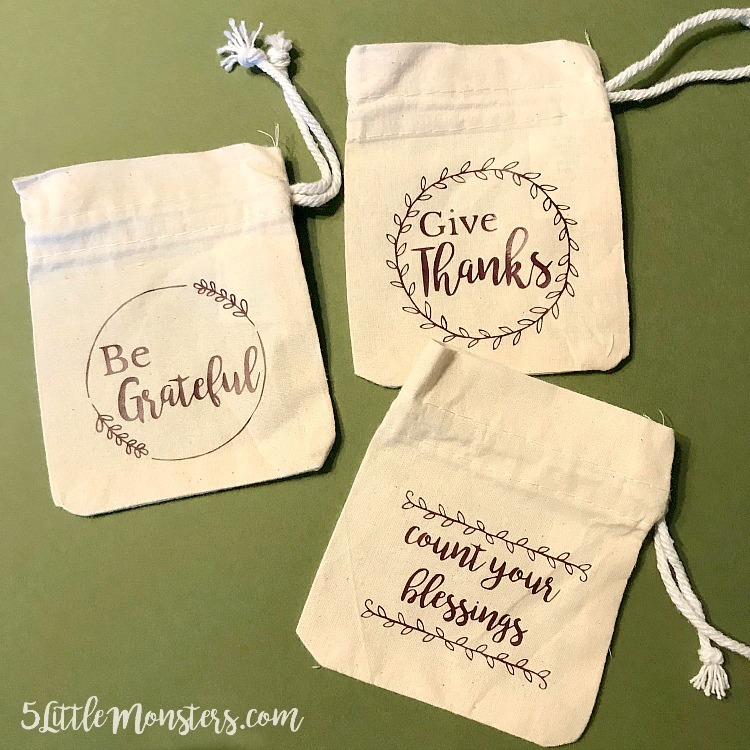 These little treat bags are super easy to make and a cute reminder to be grateful for the many blessings we each have in our lives. 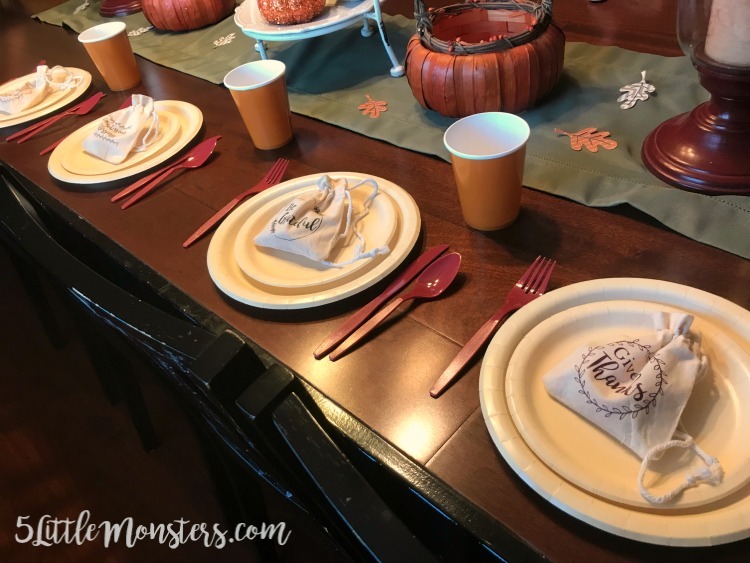 You can find the drawstring bags, candies, and lots of other Thanksgiving supplies like plates, cups, dinnerware, decor, and fun activities for the kids at Oriental Trading. 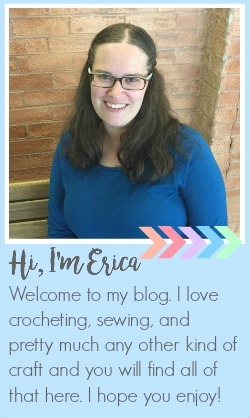 Erica, what a sweet project!